A number of changes in climatic parameters have been noted in the Priaralye and attributed to the human-induced recession of the Aral Sea since the 1960s (Molosnova et al., 1987). A general trend towards a more continental climate has been suggested by an increase in summer and decrease in winter air temperatures at stations near the shore by 1.5-2.5°C and a decline in mean annual relative humidity of 2-3 per cent, while the occurrence of drought days has increased by 300 per cent. Shifts in seasonality have also been recorded. In 1950-59, maximum precipitation fell during February-March and minimum during September, but in 1970-79 the maximum was observed in April and the minimum in July. Spring frosts have been recorded later and autumn ones earlier. Another climatic effect has resulted from the exposure of lacustrine sediments, particularly on the eastern side of the lake, since 1960. These former lake-bed areas have become a significant new source of wind-blown material. Marked increases in the annual frequency of dust storms have been recorded at several stations in the Priaralye over recent decades, although the rising frequency has not been constant at all stations (Table 22.4a). Major storms first became visible on satellite imagery in 1975 and have increased in duration as well as frequency since (Micklin, 1988; UNEP, 1992b). In a summary of estimates of the amount of material deflated annually, Glazovsky (1995b) suggests a range of 40-150 million tonnes as reasonable for the early 1990s. Sixty per cent of storms carry dust towards the south-west and 25 per cent travel westward over the Ustyurt plateau (Micklin, 1988) and Aral dust has been reported as far afield as Belarus and Lithuania to the north-west, Georgia to the west, and Afghanistan to the south-east (Letolle and Mainguet, 1993). The material is highly saline, dominated by calcium sulphate but with significant quantities of sodium chloride, sodium sulphate, magnesium sulphate, and calcium bicarbonate. 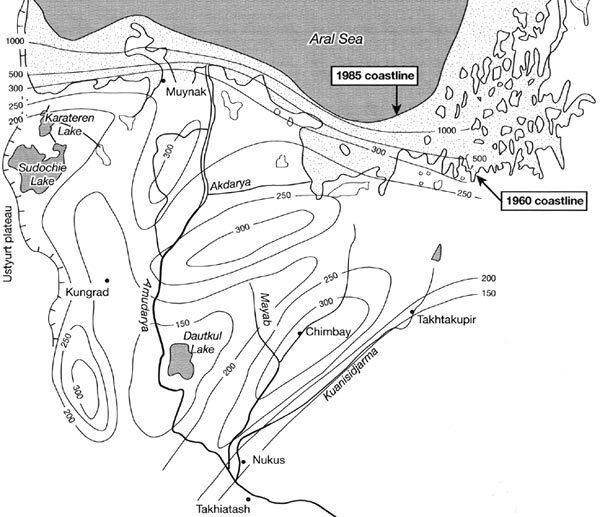 Figure 22.5 indicates the pattern of salt deposition to the south of the Aral Sea coast with deposition rates of 300 kg ha-1 in several zones up to 75 km from the coastline. Sodium chloride and sodium sulphate are particularly toxic to plants, and there is a widespread belief that this aeolian deposition of salts is adversely affecting both cropland and natural ecosystems in the Priaralye. Babaev (1996), for example, reports a steady decline in yields of pasture on the Ustyurt plateau since the 1970s, and Glazovsky (1995b) suggests that aeolian salt deposition may at least partly explain decreasing production of silkworm coccoons in Karakalpakiya. By contrast, dust storms at some stations in irrigated areas have declined in frequency since the 1950s (Table 22.4b).